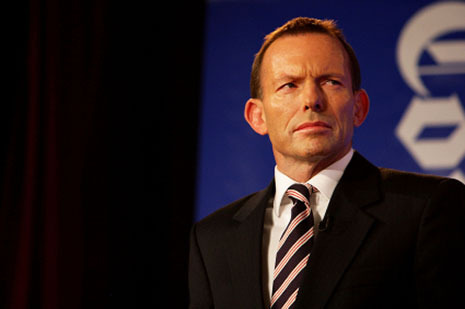 Facing a hard fact of political life: prime minister Tony Abbott. AMONG the commentators musing over the past couple of days about what an Abbott government would look and act like, a broad consensus suggests that despite the heated rhetoric of an election campaign it would be, in many ways, simply business as usual. I am unconvinced by that argument. Changes of government don’t happen all that often in Australia – just seven in the seven decades since the second world war – and a change in both substance and style is always an inevitable accompaniment. The decision to slash foreign aid, announced two days before the poll, was a clear signal of a major shift away from the priority of lifting Australia’s profile internationally, especially in the frenzied diplomacy to win a seat on the UN Security Council and the largesse that came with it. Traditionally, the Coalition is less enthusiastic about multilateral arrangements; given the aid cutbacks, we can expect a more insular approach that might force a recalibration of the sporadic regional integration process. Tony Abbott, who has shown little interest in foreign affairs, has said his first overseas visit as prime minister will be to Jakarta rather than Washington. This will be an early test: his policy on asylum seekers has strained relations with Indonesia, and some serious fence mending is needed. The Coalition has also shown some impatience with China in recent years, so it will be interesting to see Abbott’s response to Beijing’s invitation for an early visit and his handling of what is essentially a delicate balancing act between Australia’s biggest trading partner and its major security partner, the United States. But the main action will be on the domestic front. With both major parties starting to realise that the natural election cycle, at both national and state levels, is now two terms of government, there will be an early push to implement foreshadowed changes, most likely the most controversial ones first. A real challenge for the new prime minister will be to temper the diverse and possibly conflicting ideological impulses in his government. Abbott is by no means a free-market ideologue, yet he will need to assuage those of that bent within his ranks just enough to head off trouble. The allocation of portfolios will indicate where he is giving freedom to move. The public service, seen by some in the new government as a haven for Labor sympathisers, is in for both a haircut and a shake-up, but Abbott is enough of a realist, especially as a former minister, to know just how much he will need to rely on competent and sound advice. Workplace relations, which proved to be the Coalition’s undoing in 2007, will be an early test for the government and its likely hardline minister, Eric Abetz. The employer and business interest groups who supported the Coalition will be lobbying hard. Some issues that will create public noise, such as the privatisation of SBS and a radical restructuring, or even break-up, of the ABC, will be on the early agenda. So, too, will be an overhaul of universities and the Australian Research Council; on the cards is the effective corporatisation of the former and a narrowing of priorities for the latter. An expected push to privatise the successful HECS scheme of student loans will have serious implications for students and their debt burden, and also for future access to higher education. But the extent to which this extensive shopping list can become a political reality remains to be seen, no matter how hard the new government blusters. Central to this question, of course, is the very vexed question of the Senate. Like all incoming governments, Tony Abbott has waved that tired old flag, the mandate, implying that the Senate, whatever its composition, should merely capitulate to the majority in the lower house – a quite disingenuous reading of democratic practice, not to mention the constitution. The hard fact of political life is that the Coalition didn’t win a majority of the primary vote in the election, the only real basis to claim a mandate. 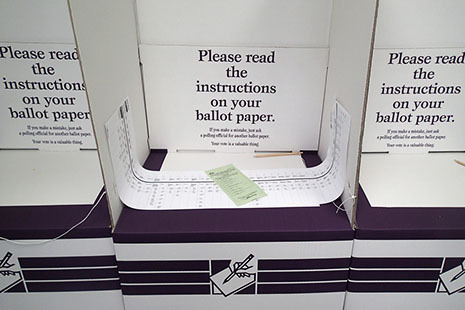 More people gave their primary vote to a non-Coalition rather than a Coalition candidate. And the evidence suggests that many who gave their primary vote to the Coalition in the House took their Senate vote elsewhere, presumably as a safeguard. This leaves Abbott with a problem that prime ministers before him have shared: how to manage a hostile Senate. The current Senate, with its Labor–Green majority, runs until the middle of next year, when the new Senate, still lacking a Coalition majority, is sworn in. All indications point to a plethora of minor party candidates of widely diverse interests having to be won over, bought off or neutralised. The solution offered by the constitution is to call a double dissolution, but Abbott faces a problem not shared by earlier prime ministers: the spectre that such an election would not eliminate the nuisance of small parties and might well increase their representation, given that in a double dissolution election the quota for a senator’s election is half that of a normal half-Senate election. A record 529 Senate candidates are contesting this election.